Every parent wants to raise children who have the skills they need to make smart financial decisions. Some of that desire is self-serving; after all, no one wants to be roommates with a 35-year-old who can’t pay their bills. Giving your kids the skills they need to manage their money helps them gain independence, and gives you peace of mind that they can fend for themselves once they aren’t living under your roof anymore. And above all, it will hopefully keep them from returning to the nest once they’ve flown the coop. Yet for all of the good habits we teach our kids — the rule of thirds (spend, save, give), for example, or how to read the fine print on credit card offers — many of us inadvertently teach them bad money habits. We forget that they are always watching, and that many of the things we do every day send the exact opposite message than the one we want them to learn. These behaviors might seem innocent, but they can have lasting consequences. These days, using cash to pay for anything seems quaint and almost strange. Why carry cash that can be lost or stolen when you can buy anything with a credit or debit card? Therefore, it’s important to help your kids connect plastic with real money in a bank account, not a magical money tree that gives them everything they want. Instead of using your card everywhere, use cash when possible to show how it dwindles when you spend it. Write down your transactions in your checkbook ledger, showing kids how the balance decreases with every purchase. Above all, explain that credit cards are essentially a temporary loan and you have to repay all purchases, with interest. Adults often justify spending with statements like, “I work hard — I deserve this,” or “It was on sale!” And there is nothing wrong with an occasional treat or impulsive buy. Yet when every trip to the store becomes a free-for-all where you purchase things you don’t really need without a second thought, you aren’t setting your kids up for financial success. It’s fun to joke about all of the ways that Target “tricks” you into spending money, but it sends a better message to your kids when you control your desires and stick to your budget. Besides, it’s easier to say “no” to their demands for a new toy or other impulse buy when you practice what you preach and keep your own spending under control. If you have a hard time with self-control, impose a 24-hour waiting period on all unplanned purchases. If you are still thinking about the item 24 hours later, and you’ve done your research to make sure you’re getting the best deal, then go back and buy it. More often than not, you’ll forget about the item altogether – and still have cash in your pocket. Once your kids hit elementary school, they are capable of understanding the concept of a budget. 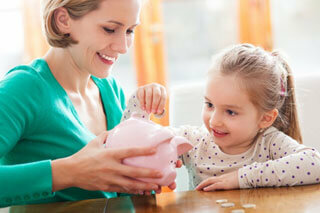 Yet so many parents keep their kids in the dark when it comes to planning household expenses. Kids don’t need to know every detail of your household bills, but you need to teach them about setting limits and spending within their means. Talk to your kids about budgeting, and the bills you have to pay each month, like the mortgage, utilities, and transportation costs before you can buy “extras” like new toys or fun excursions. You can also provide real world budgeting exercises. Grocery shopping is a great place to begin this process; using your weekly budget, get your kids to help make the shopping list, compare prices, and make decisions in the store. By giving them some limits, they can learn to become smarter shoppers, and develop decision-making skills. When your kid asks for a new gaming system or another expensive toy, what’s your response? You probably say “no,” with the explanation that you can’t afford it. Even if you cannot afford to make a purchase, experts caution against using “we can’t afford it” as a substitute for saying no. One study indicated that the majority of kids don’t actually believe their parents anyway, while making such statements can cause anxiety among others. It’s always better to be honest with your kids (“We aren’t buying a new game system because the one you have is only a few years old") and frame money discussions in terms of priorities. In other words, saying, “We are saving money for our vacation,” sends the message that you cannot just buy whatever they want, and that budgeting and saving is important. If your child insists that he or she wants something, work together to come up with a plan to make it happen. That new game system can be earned by doing chores, for example, and saving birthday and holiday money. Finally, making mistakes is a part of the learning process — and you have to let your kids make some mistakes with their money to develop a sense of how to manage it well. Giving them the opportunity to make their own choices about how and where to spend their money (assuming that they have already saved a portion of it) can be a powerful lesson in consequences and budgeting. Let them make their own decisions, and talk with them about their choice instead of taking over and doing everything yourself. When they have to work harder and wait to buy something that they really want because they spent all of their money on useless trinkets, they’ll learn an important lesson and be more likely to make better decisions in the future. Teaching kids about money requires paying attention not only to the basics of finance, but our own habits as well. Watch how you handle and talk about money with your kids, and you have a better chance of raising financially savvy individuals who won’t be back under your roof when they’re in their 30s. Tiffany Rowe is a marketing administrator who assists in contributing resourceful content throughout the World Wide Web. Tiffany prides herself in her ability to provide high quality content that readers will find valuable and resourceful. She often enjoys photography of nature, researching new SEO and writing trends and D.I.Y crafting.